Fall is officially on! For a large part of the Northern Hemisphere, autumn fall landscapes are already noticeable, the falling leaves are starting to display their radiant shades of red, orange, brown, gold, and yellow. Dashing around you’ll notice the leaves’ green pigments start to break down and eventually turn into brown as the air starts to cool and daylight hours start to shorten. Doing so will help them survive the winter for it reduces their water needs and their susceptibility to the winter’s harsh conditions. Celebrating such a wonderful and vibrant season, this beautiful collection of autumn landscape photos will give you a double dose of relaxation to invigorate your mood. Whether you’re working on your computer with warm socks while sipping your freshly brewed coffee or just having your time alone outside with your computer, you will enjoy looking at these pictures that highlight the last explosion of rich, glowing color before the coming winter. 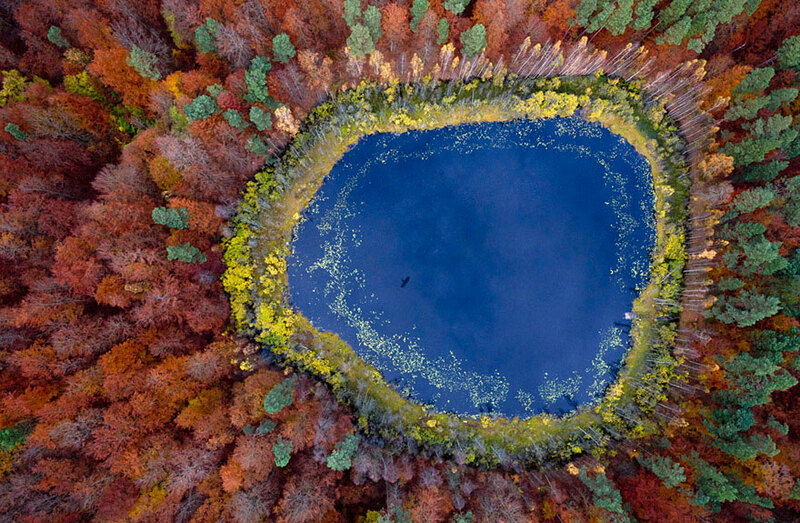 When the changing palette of trees is in blazing bloom, you know that autumn is already starting, and this is how autumn has highlighted the rich, sky color of the lake! With a little tickling on the computer, this marvelous autumn fall landscape could bring your imagination to places. Pastel-colored tree tops around the lake, it’s like a blasting fireworks during the New Year’s Eve. Autumn fall landscape just outside your window – can you imagine how colorful your room would be each time the sun rises? A glowing combination of yellow, orange, and red reflection could liven up your room, thus giving you an invigorating mood throughout the day. 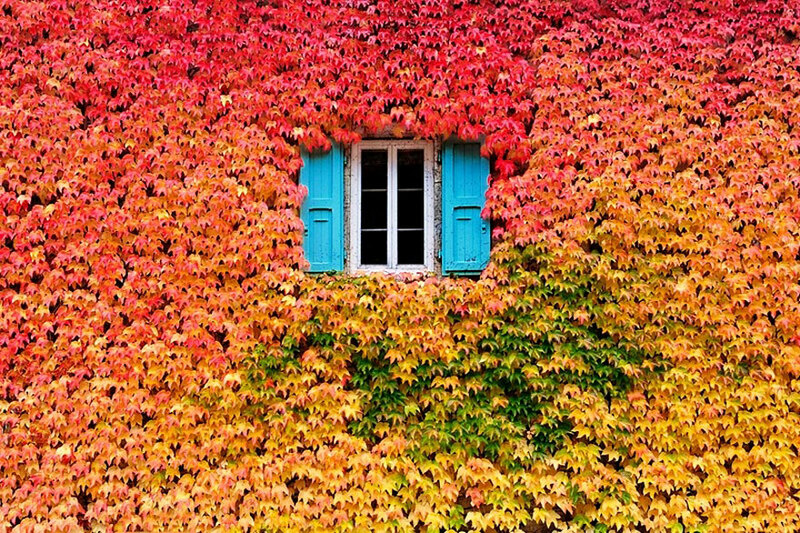 This picture of autumn outside your window can simply stir your imagination. You would think that this image of red, orange, and fuchsia ball-shaped grasses is just a product of imagination – wrong! 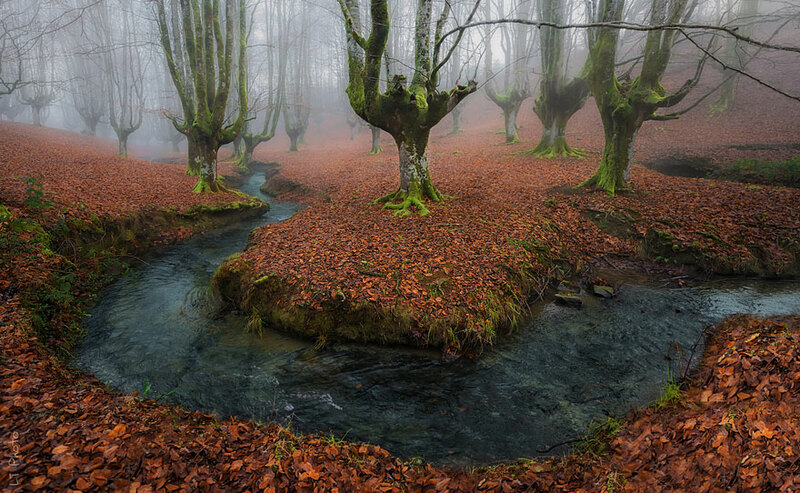 This amazing picturesque is actually the nature’s rendition of one of its mysteries. With the appropriate boosting of colours and artistic thoughts, this magnificent image was born. 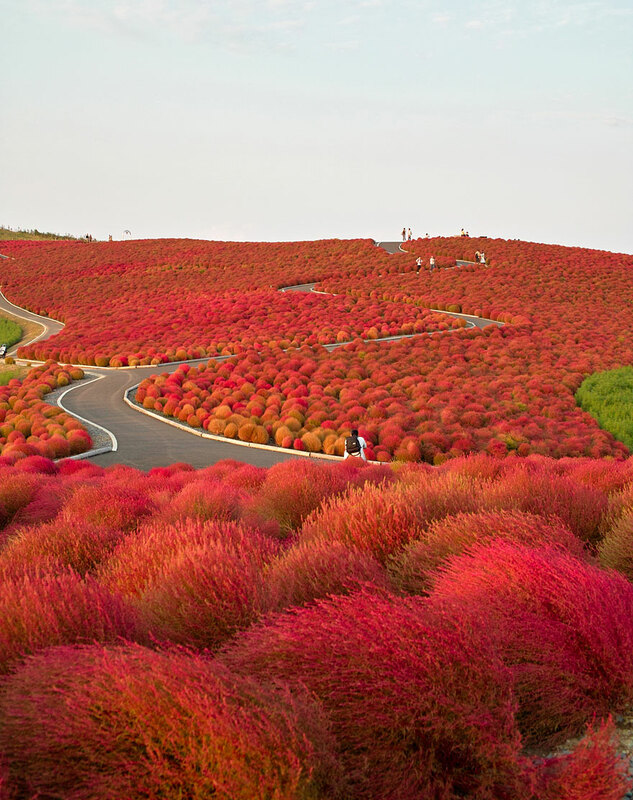 Just imagine yourself walking along the path with these colourful grass-balls on each side of the road. As if you are either walking inside a painting or being in your grandest dream. You’re right in front of these multi-coloured grass with the beautiful blue skies as the background. How wonderful this image is! Red, red, red. 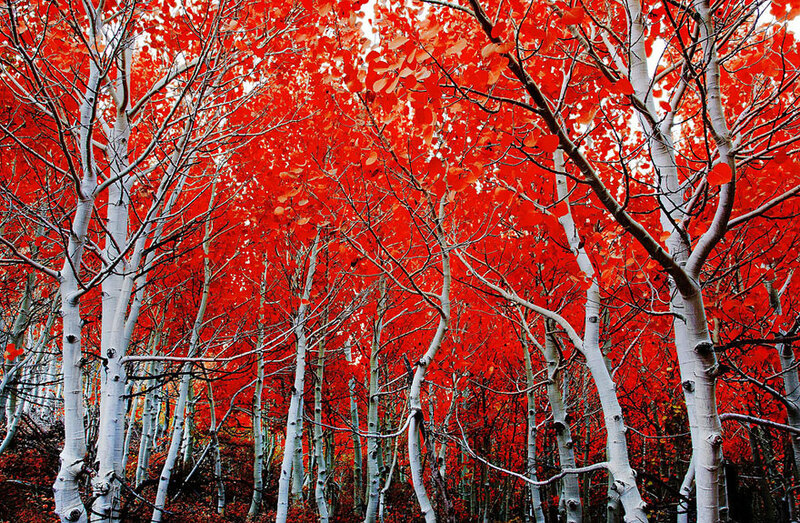 Hiking into the woods under these red-leaf trees is more fun and exciting than any other days. 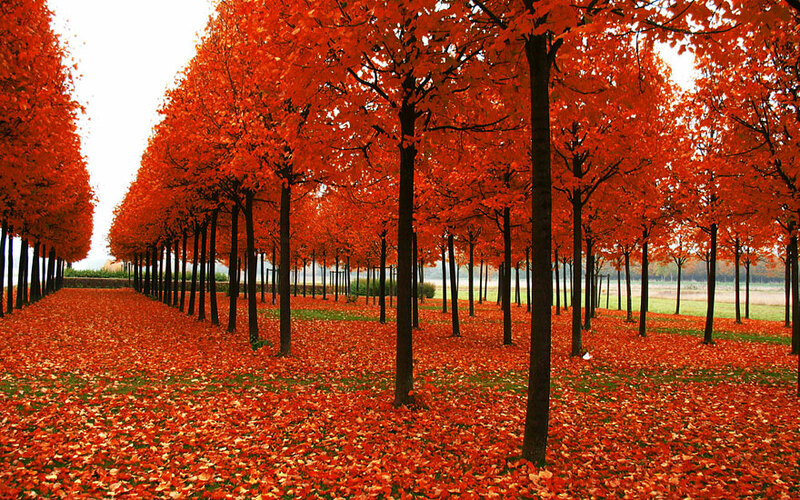 It looks like a battalion of painters have intricately painted each leaf with red paint. Pair it with mild autumn days and cool evenings, these “red heads” produce more striking and vivacious red color. The woods couldn’t be this perfect if daytime temperatures are too warm for an extended period of time. 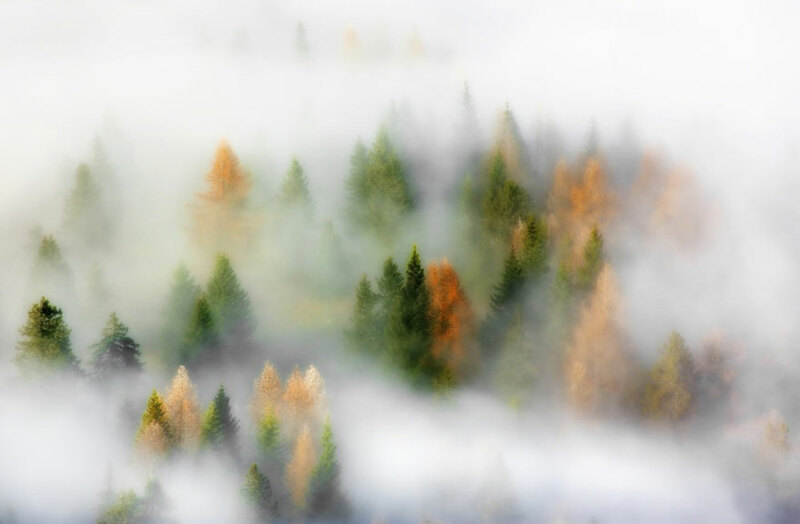 Whether it’s sunny or foggy, these pine tree tops doesn’t fail in taking someone’s breath away. You can’t get enough of it, you couldn’t wait to buckle up and get up close and personal with the scenery. Looking at this picture is a reminder of the medieval time, an era where prince is saddled up with his horse, passing through this breezy forest just to be with his true love. And his princess, waiting all alone in one of those trees, is filled with high hopes that her prince would come soon and will live happily ever after. On the scientific side, the browning of leaves, as the most apparent sign of fall, takes place when the air starts to cool and daylight hours start to shorten. This is in opposition during summer time when leaves remain green because chlorophyll pigments help absorb energy from the sun. 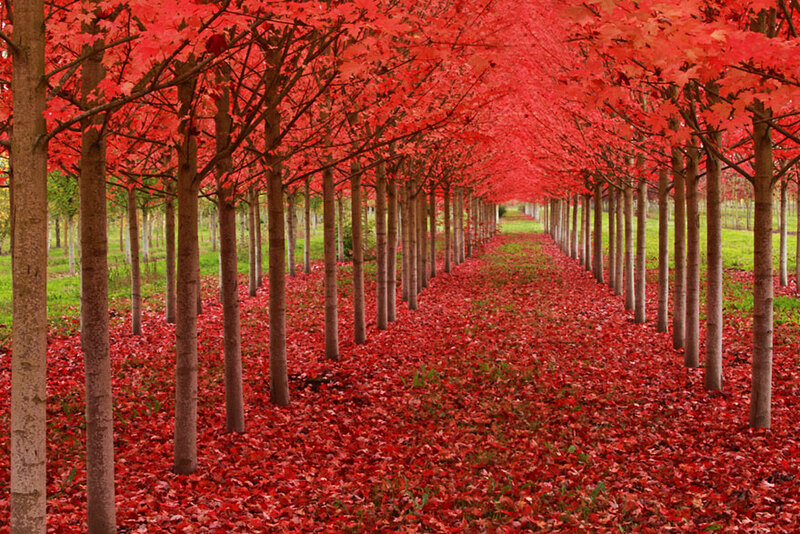 Ever tried walking in a carpet of red leaves? We usually see this in movies most especially in romantic ones, and it simply adds an appeal to the story. Would it feel the same if a guy bends his knees, offers his girlfriend a ring, asking her to marry him on all-green background? I don’t think so. 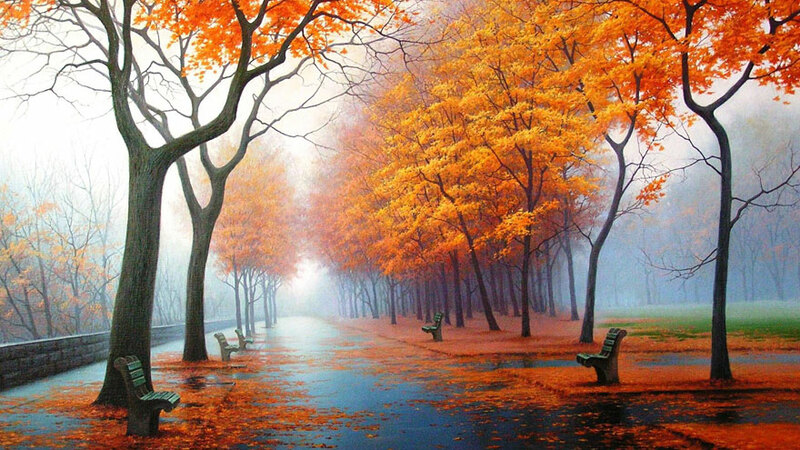 A look on this enchanting picture is like walking through a hazy, orange pathway. The crisp sound of dry maple leaves as you step on them is like music to the ears; the cool gust of the autumn wind soothes into the lungs. All the other colors we see in the fall are always present in leaves even during summer. It is only that the leaves’ green pigments break down, thus revealing its hidden color. 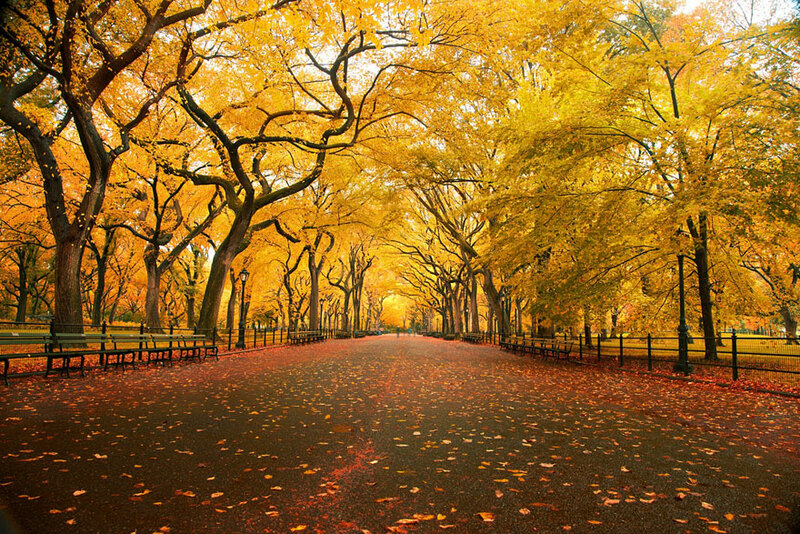 During autumn, leaves are shed to help the trees survive the winter. This shedding diminishes trees’ water needs and reduces their defencelessness to the winter’s harsh situation. When you look at the trees in their most immaculate moment of red-gold-orange splendour, something about it is extraordinarily gratifying. Although it brings ever more uncontrollable coldness and the longest months of leafless, twisted trees, you realize how beautiful all the things are that you are about to lose. It is the season where everything seems to be just on the verge of phenomenon, where the freezing coldness might get worse. 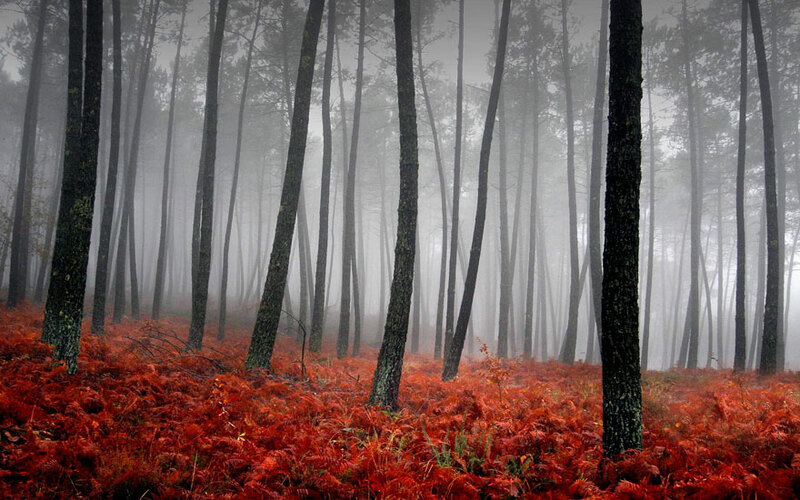 Until the time when you step outside your door and see this magnificent autumn fall landscapes. Imagine yourself sitting on one of the benches in the portrait. It will compel you to consider spending long days in a warm, cosy couch in a quiet coffee shop. You long to hear the sounds of steaming milk and tinkling of coffee mugs. You would like to write about anything – just anything. 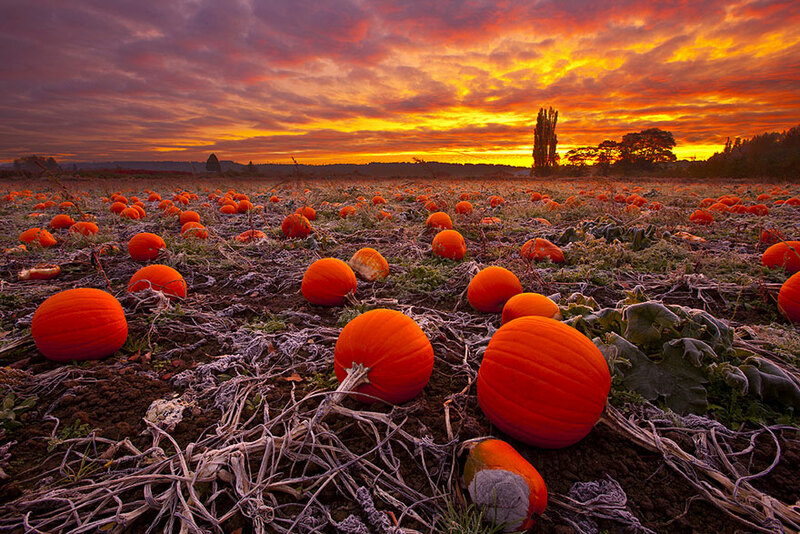 Other indications that it is already fall are pumpkins and gourds. Why? Because it is these foods’ harvest season. The swirl of colors and the smell perfectly complete this season’s distinction. So whether you’re taking pleasure over a warm cup of coffee or tea, jumping in the biggest stack of leaves, or making pumpkin pie, savour every moment of the season! Autumn is stunning and tranquil. It is extremely admired by the lovers of beauties, of poets and of artists. For some, it is the time when spiritual energy exudes because we are able to meditate and slow down with our busy lives. The sight of red and yellow, purple, and deep burgundy leaves is absolutely a grand autumn fall landscape.